Dominating the Olympic Peninsula is the Olympic Range itself, a jumble of jagged peaks that reach nearly 8,000 feet. Distinct from the gentler coast ranges to the south and north, Olympics geology resulted from a subducting oceanic plate. This resulted in the uplift of sedimentary, volcanic, and metamorphic rock. During the ice ages, a continental ice sheet flowed around the flanks of the Olympic Range. It created an outwash that isolated the mountainous peninsula from the Cascades. The advance and retreat of glaciers later sculpted the craggy peaks. 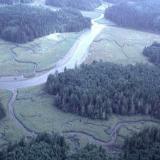 Many rivers flow to the coast, including the Soleduck, Bogachiel, Hoh, Queets, Quinault, Humptulips, and Wynoochee. Between the peaks and shoreline, a coastal plain extends through much of the peninsula. In contrast, the Willapa Hills to the south are a softer, more eroded landform. Their highest point barely tops 3,100 feet. The Chehalis River, the second largest river basin in the state, flows through the Willapa Hills and empties into Grays Harbor. During the Pleistocene, the Chehalis was a vast glacial river that drained the Puget Trough. In addition to miles of ocean shoreline, the coast counts three important estuaries, the Columbia River, Willapa Bay, and Grays Harbor.